The fact is, if hunky Christian guy marries hottie non-Christian gal, it’s likely that his Jesus-center is, well, not very central anyway. Is it a slap in the face to the parents and the church? It might be, but so what? Jesus’ love is stronger than slaps, and even nails and spears. Is it going to create complicated family and church situations? Yes, it is. My family and I love the Broadway musical, Fiddler on the Roof. We saw the Mosinee High School do a wonderful rendition of it in the 90’s and we still watch the VHS tapes of the movie version with Topol. It’s about heartwarming drama and beautiful melodies, but it also embraces some very challenging social issues. Tzeitel is the first of the five daughters of Tevye and Golde. She is also the first to stretch the bounds of tradition by secretly pledging to be married to Motel, the tailor. Tevye begrudgingly accepts them. Hodel, the second daughter, stretches tradition farther when she and Perchik announce their engagement to Tevye. 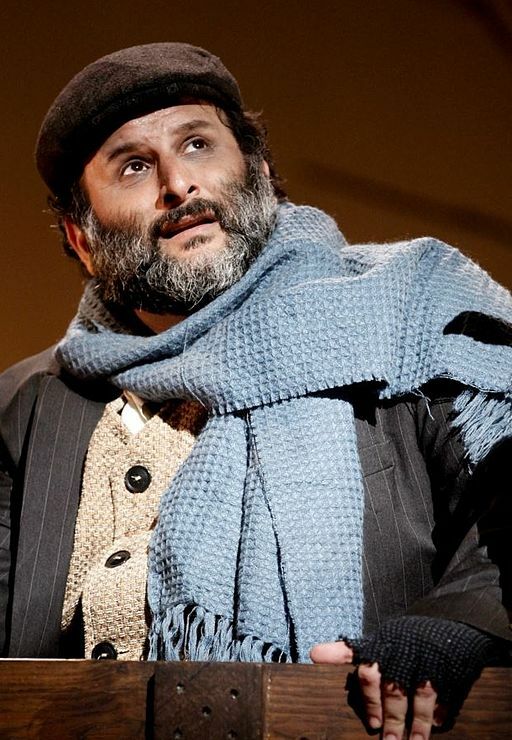 After, again, erupting in anger, Tevye argues himself into accepting Perchik and Hodel as well. Chava, the third marriageable daughter, stretches beyond where tradition will allow Tevye to go. Chava falls in love with Russian gentile, Fyedka. The most heartbreaking moment of the drama shows Chava dropping to her knees in the field, screaming, “Papa!” as he turns his back to reject the couple and declare his daughter dead to him. First, what’s at stake if we consider marrying outside the Christian faith? Well, if your faith is largely symbolic or social, it may not be a big deal to marry outside the faith. It’s just a cultural experience then, right? “Wait,” you say. “That whole list is different from person to person anyway, even within the church.” I agree to a point. But if the God of the Bible is shaping our lives, then those variables will find some valuable common ground. I can’t imagine not worshipping with Colleen. It’s one of our favorite things to do together. Deeply bonding. I can’t imagine raising children without God as a mutual foundation. We still have differences to work through, but God is our rock. The point is not, “Would it be impossible for us to make a life together?” The point is that, when you wake up in your 40s and realize that you’re living life alone because you have so little in common with this person…is that what you want to do? If your core values are wildly different, you end up needing to isolate to maintain your identity. Part of the beauty of marriage is finding a soul mate and friend who will celebrate with you and mourn with you. A mixed-faith marriage is a setup for your spouse to be your number one opponent. Second, what should be the response of the Christian community to mixed-faith marriages? Having said all of the above, mixed-faith marriages happen for many reasons. People get married fresh out of college when spirituality isn’t important to them, and then they have kids and realize they want to get back to a God foundation. That’s a common example. Or, hunky Christian guy finds hottie non-Christian gal and a long list of considerations gets wiped out by a whirlwind of hormones and chemistry. What then? Should the parents and the church turn their backs like Tevye and pronounce them dead to us? No, and by the way, make sure you watch Fiddler all the way to the end. The fact is, if hunky Christian guy marries hottie non-Christian gal, it’s likely that his Jesus-center is, well, not very central anyway. Is it a slap in the face to the parents and the church? It might be, but so what? Jesus’ love is stronger than slaps, and even nails and spears. Is it going to create complicated family and church situations? Yes, it is. And I encourage parents and church leaders to embrace that complexity as a way of showing Jesus’ love to believer, unbeliever, children, and everyone involved. Will there need to be boundaries drawn and standards held? Yes, and those won’t always be easy. Do the kids get taken to Bible club? Do unmarried boyfriend and girlfriend get to sleep together in their parents’ house? In their grandparents’ house? What do we do with alcohol and R-rated movies? How do we talk about Jesus-followers around the children? Do you say grace at meals? Do we talk about Jesus as Savior of the world, a good teacher, or a figment of people’s nutty imaginations? Got any words of wisdom for people considering mixed faith marriage?